I had to put art up sooner or later. My walls have been completely bare and cheerless. And I had a day. A day when I didn't have any particular plans. As I drank my tea and finished reading my recent House and Home, I got inspired to unearth an art project that I'd dreamt up over three years ago at IKEA. It's new and it's here. And you can sit on it. Delivered fresh about an hour ago. So far, I love it. And I haven't even sat in it at my own house yet. But I still love it. The right colour (too dark? I'm bluffing this confidence.). And it had better be the right size (you see?). Blue Rodeo. Basically, we're best friends now. So, you know, you're at a 40th anniversary party for the molecular genetics department at UofT. And, you know, Blue Rodeo happens to come on. 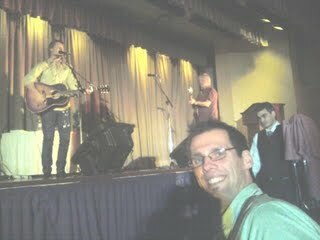 Jim Cuddy and Greg Keeler. And they're singing and playing and you're thinking, "Wow, is this really happening?" But, ya, this just happened. My brother Matt and I are a little bit stunned right now. And Matt's singing in the shower. After just emailing them. You may have seen The Orange Couch in previous pics of my house online. I like The Orange Couch. It's a good couch. A pull-out. Bright. Comfy. Cheap. It's been like a friend for the past five years. 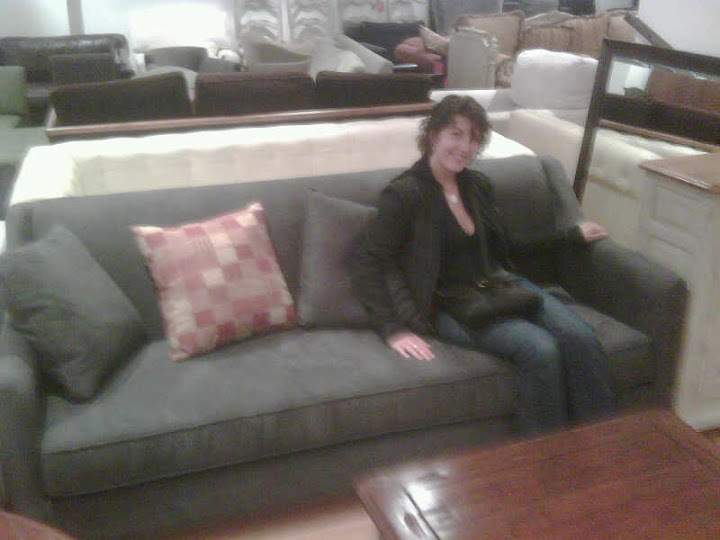 But someone recently told me that I probably need a different couch. And so began the search. I won't say it's been particularly arduous. Certainly not as time consuming as my search for the perfect upholstery fabric for my window seat, which, this weekend (a fine, wonderful, relaxing weekend), led me to break down and use the fabric that I'd long ago picked out, bought, but thought was inappropriate. It probably IS inappropriate, but over six months later, I'm kind of thinking I don't care. I just want to sit on the stupid window seat. I'm eating my mom's apple crisp for lunch and I'm happy. I just announced on Facebook that I'm learning to calm the f down. My week-long migraine has subsided and my shoulders are as far away from my ears as they've been in weeks. But, according to Facebook's US-happiness-index, it's likely that I'm not as happy as I was last Christmas. Unless of course, Canadians are as happy as Americans around Thanksgiving. I would say, actually, that this past weekend and couple of days have seen me as content as I can be, given a house of mass-chaos and a behind-schedule project.